This entry is being written from memory 7 days later. I’ve decided I’ve had enough and have stopped calling the nurses for help. If I’m going to get out of here, I need to do things myself, right? I’ve been getting up and using the bathroom myself, as well as getting my pump supplies ready, pumping and cleaning up afterwards. It hurts a lot and I go very slowly, but I’m doing it. Dr. K comes by to visit me and we talk about the medication issue. She allows me to stay on the Vicodin at one to two pills every 4 hours as needed. She verbally OKs one pill every 3 hours, which is what I am doing now because I pump every three hours and it’s easier to do both at once. I’ve talked to Skip and he will be leaving Seattle this afternoon and coming to get me. We’ll get Calista and spend the night at home together before taking Calista school — where Lindsay will pick her up — and heading down to Seattle. Skip arrives and we get ourselves ready to go. I am slow to move and need his help getting dressed, but am eager to leave. We are discharged at 6 pm and I am finally free! I wish the answer was “YES!” but the truth is, we will be leaving again tomorrow. I tell her that Mommy, Daddy and Calista will still have some time apart, but that we’re all going to be together very soon. We have conversation and fun on the drive home. At home, a package awaits on the front step for Calista and she’s thrilled. It’s her Halloween costume from Grammy. 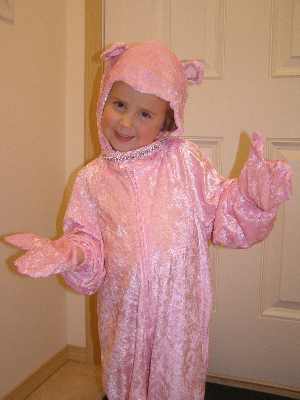 She’s going to be a pink kitty cat and immediately wants to try on her outfit, so we let her. 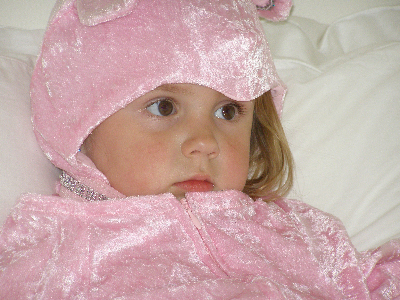 She wore it until she went to bed, our little pink kitty cat. I’ve got my pumping station set up in our bedroom and am having trouble getting in and out of bed. I hope that recovery starts to go a little faster from here on out. Tomorrow, I will be meeting my boys and I can’t wait. Next The Cronck Family has Grown by Four Feet!